Another work week in the books and another week closer to Christmas! How many of you are planning on knocking out some holiday shopping this weekend? I am! So I thought I would change it up and feature some great gift ideas for the men in your life! I love this Banana Republic zip-up vest because it's not overly puffy and the material is a soft twill. Comes in tall sizes too! 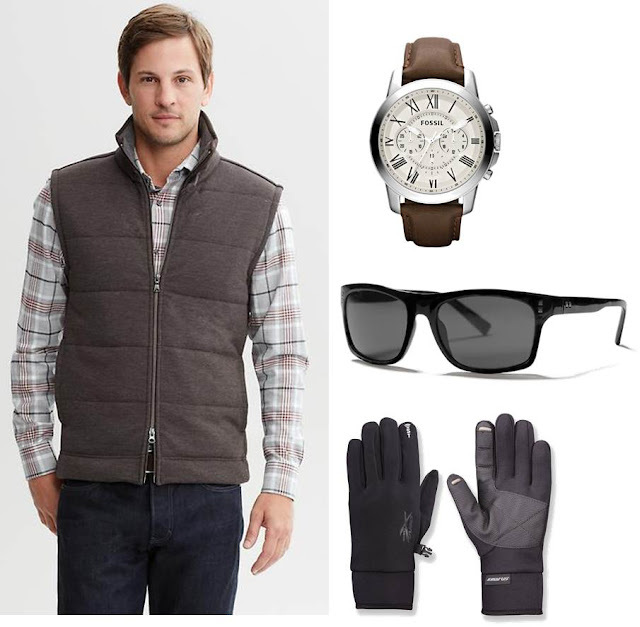 This Fossil leather band watch looks casual yet classic. Perfect for weekend wear. A cool pair of shades make a great gift. And secretly, I like to pick out my hubby's sunglasses so I can make sure they aren't super dorky looking. These gloves are were made for James Bond. Waterproof, tech-friendly, and PVC gripped so you don't drop your phone in the snow! Genius! If your man is a golf addict like mine, you can't go wrong with any of these options. yet still looks stylish! A win, win! he'll be singing your praises! so it's easy for your man to stay color-coordinated! 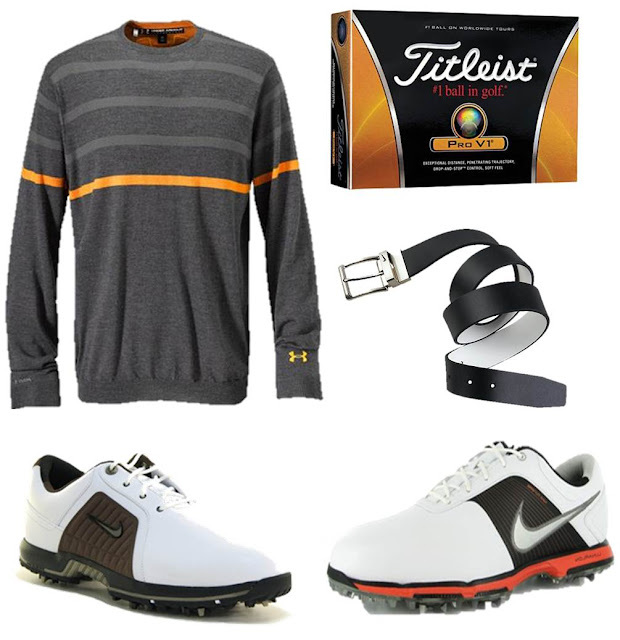 Golf shoes are also a great option, especially if your man is over due for a new pair. Both of these options (left shoe $50, right shoe $89) are under $100 bucks! Last but not least, a friend of mine recently started a t-shirt company, called 19nine, that specializes in comfortable/vintage type/sports-related t-shirts. Ladies, they are the kind of t-shirts you actually WANT your man to wear! What makes them extra cool is that each t-shirt has a legendary sports-related story behind them. For example, the green t-shirt on the left is about the first season that Notre Dame debuted the green jerseys and ended up bringing home the National Championship that year. My fiance would TOTALLY wear that entire Golf ensemble! Great picks! Thanks! I feel like you can't go wrong with golf attire!